SCROLL DOWN to See ALL Tennis Coach Gift Ideas and the Tennis Tips Videos. 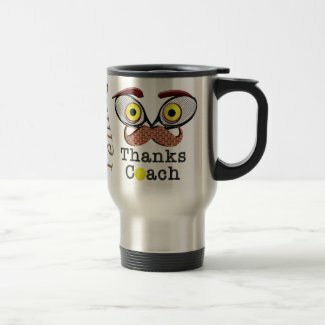 CLICK IMAGE to view Details on the Stainless Steel Tennis Mug for Coaches. Available in many mug styles including White and Stainless Steel Mugs, Ceramic, Frosted and more. Cheap Tennis Gifts for Coaches that you Personalize. Click on the image of the Tennis Keychains to read details or to personalize it. 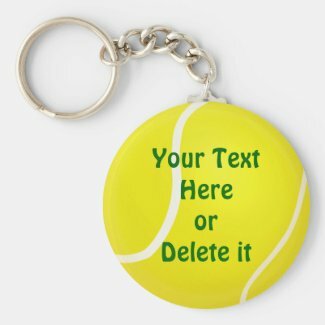 Just Highlight the Temporary Text which is located underneath the “Edit this design template” section to yiur right on the tennis product’s Zazzle page. Type in Your Coach’s NAME, YEAR, Team Name, etc. Fast service and BULK discounts with orders of 10 or more Tennis Keychains. No Minimum order. You can buy just One or buy more. For multiple different names, <b>Personalize One Tennis Ball Keychain at a time, then “ADD it to the CART” and then Go Back</b> to personalize the next Tennis Key Chain. So many more Tennis Coach Gift Ideas and for players too. 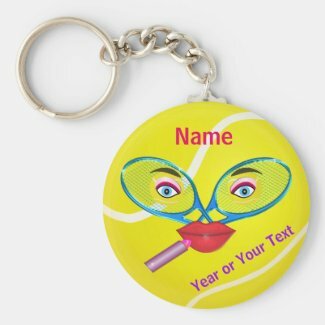 So if you are looking for neat Tennis Captain Gifts, please consider Little Linda Pinda Designs at Zazzle. “Thanks Coach” in black metal like font with a cool Fun Tennis Racquet and Balls Face with a big brown Mustache. On the other side is a large yellow tennis ball with “Thanks Coach” again. Two different designs for the price of one. It will be so much fun giving these funny tennis gifts to coaches and players. Great Christmas and Birthday gift ideas for tennis players who love the game. Tennis players are passionate about their favorite sport. For Tennis Coach Gift Ideas Under $50, how about a Tennis Watch for Coaches and Players. Shown is the same Tennis Design but on 2 of the many watch styles. The first is the Ladies style Tennis Watch and the second is one of the Men’s Watch Styles or select a different style watch. Watch styles for children too. Some of the tennis watches have different colored bands available. Scroll down on your right underneath the “Styles Options” to see the many watch styles available for Kids, Men and Women. Hit Your Backhand Like Stanislas Wawrinka – One Handed Backhand Tennis Lesson by: Essential Tennis. Clear, concise teaching methods that you will find easy to understand and implement. The Video has tens of thousands of subscribers. That is a great sign of a great Tennis Video Tutorial. Pick up a Tennis Ball and hold it until your partner or other player is ready to receive it. I know people who have gotten badly hurt by a ball laying on the court, even close to the net. Be Honest. When making your own calls because you don’t have an official, always be honest. If you don’t know if the ball was in or out, say you don’t know. Congratulate the winning team or be a good winner. Don’t talk badly about your team mate or the opposing team. Be willing and nice about playing with a beginner tennis player or someone who is not “as good as you are”. I am so happy you came to visit Tennis Coach Gift Ideas. Please call me if you would like a special custom gift created for you. I also place any of my designs on any Zazzle merchandise. Linda at: 239-949-9090. 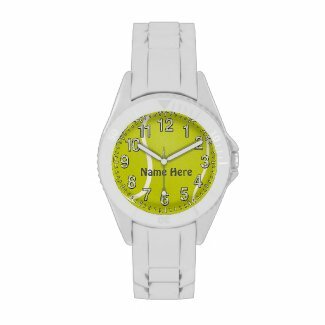 I am able to put ANY of my Designs on ANY Zazzle merchandise. Photo gifts, Personalization Gifts and whatever you can think of. I only do “G Rated Designs”. God Bless You and have a wonderful and healthy day. I am still in awe of how people from all over the globe buy my designs. They are affordable products yet great quality and the printing is amazing. Beginner Tennis Etiquette Tips and really good Tennis Tips and One Handed Backhand Tips Video are ABOVE. See how to get a great Backhand Techniques to help you win the game and match. GiftsForCreaivePeople.com CLICK HERE to see lots more Sports Gift Ideas for Coaches, Players, Mom and Dad and of course the Fans. Also Personalization Gifts with YOUR PHOTO and YOUR TEXT. These Tennis Coach Gifts and Mugs are such nice presents. They are well made with outstanding printing quality. See you at the courts. Thanks so much for stopping by our Tennis Coach Gift Ideas article. I hope you enjoyed it. Call me if I can create a tennis coach gift personalized just for your tennis captain / coach. [email protected] Subject Line “CONTACT” in Caps please. Please call if you can.